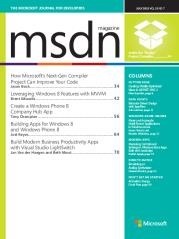 The July issue of MSDN Magazine has my first contribution to the magazine, Creating a Windows Phone 8 Company Hub App. The online version of it can be found at http://tonyc.me/14mRvRr. The article was probably the most involved article that I have written to date. So what’s in the article? Why all kinds of awesomeness on creating a company hub app to allow you to deploy your Windows Phone 8 apps to the device in an unmanaged way without going through the store. There is a complete example of the client available as a download with the article. How about what’s not in the article? Well, at the end of the day, 3,000 words is not a ton of space to flush out a topic the size of company hub apps. This article addresses the client side and all of the API’s needed to accomplish it. What is not covered is the server side for managing the apps to be deployed. So guess what? I’m working on a blog series to address that very topic. So if you are interested in company hub apps, stay tuned, because we will be discussing it here.